Tsuruga Castle(鶴ヶ城), aka Wakamatsu Castle (若松城), is one of the best Sakura spots in Aizu-Wakamatsu. It is chosen as one of 100 best Sakura spots. 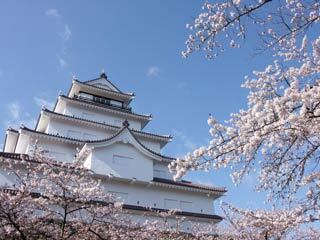 There are about 1,000 Sakura in this castle, and people in Aizu enjoy the arrival of Spring in the end of April. At night there is a light-up for Sakura and the castle at the same time. There is parking. You can have Hanami party, but no food stands. Sakura is planted around the moat, sannomaru, Kitademaru, Nishidemaru and Honmaru.